About two years ago I got the chance to ask Leonard Co what tree he considered the most beautiful. His answer was that he is a man of science not a gardener. He considers every tree in the forest beautiful. The mere sight of a forest tree excited him. But not contented with his answer I rephrased my question to what tree would you want to see planted in Manila. I finally squeezed an answer from him. He considered the following worthy for urban-scaping. Choice no. 1 was Pittosporum pentandrum or mamalis. He said he would love to see this tree replace the Acacia auriculiformis as a street tree in the metro. At that time I personally have not seen a specimen of mamalis. After a couple of months I found specimens planted in UPLB at the College of Forestry. Mamalis has glossy fine slender leaves arranged in attractive whorls. Its crown is full and compact and was indeed very attractive especially when it is in flower. 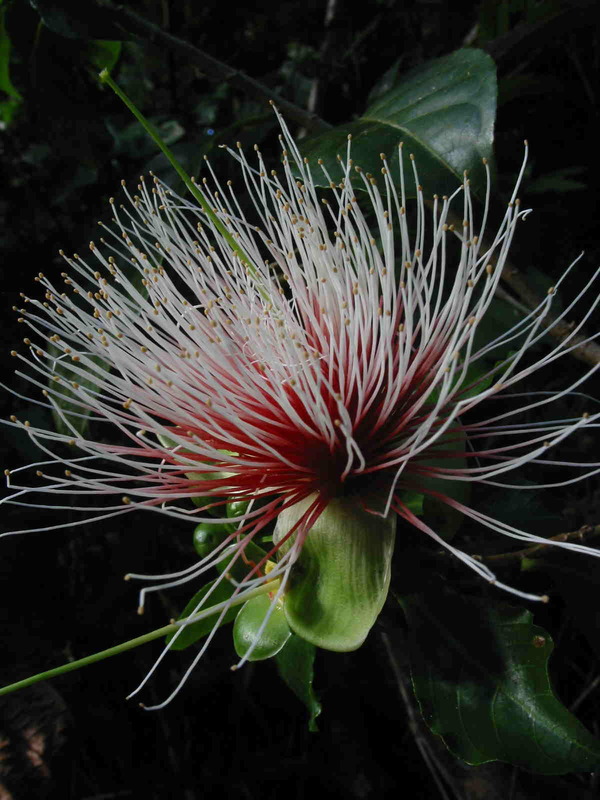 Leonard's last choice mentioned was Planchonia spectabilis or lamog. He said he liked it because of the impressive filamentous flowers. I asked him if this could grow in Manila and he mentioned they could grow in Antipolo, as he have seen them growing in Eulogio Lopez Center (I got to tour the EL Center with Leonard but we did not find the lamog). Later on I found out that lamog is synonymous to what the Tagalogs call malauban (from where Mauban town was named after). They are quite common in Laguna and Quezon. The lamog flower picture was from Leonard. Today, both trees are still unheard of in Metro Manila. I personally have not seen good-sized specimens planted in any local garden. But last year I was gifted with single small seedlings of mamalis and lamog (by Reynold Sioson and Ronald Achacoso respectively). They grew quite well potted in my roof top garden. They may prove to be promising trees for metro gardening. Leonard was right after all. I took the first picture from Anthony Arbias's web page. I posted it not because it is only one of few pics of myself with Leonard Co (as always I am the one who takes pictures) but more because it is the best one that illustrates how I remember him, a great teacher. I was never enrolled in his class but while doing my thesis, I probably got the greatest crash course one could get on native trees. 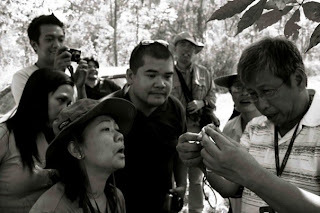 Most of the education I learned (along with my colleagues in the Philippine Native Plant Conservation Society) from Leonard did not come from the classroom. In a lot of cases they were included in casual conversations over a cup of brewed coffee (from the old PNPCSI office in Wildlife Park) while he recounted his trips and adventures in the mountains and forests. A few times they were in immersion trips to forests, where we probably got the best biology lessons. But everytime we were always treated to in -depth and detailed accounts of plants he encountered. Usually when he comes back from his expeditions, he would round up the PNPCSI guys and spend hours showing slides and pictures of specimens. Leonard really loved to talk about plants, moreso when he was immersed in his element, at the heart of a forested area. In my first immersion trip with him, I remember intentionally sitting beside him in the vehicle we used, just to get the most information I could get out of him (for my thesis). But eventually I learned that I needed not to do such. He readily gave out information, not for my sole benefit, but more to make us aware of these non-popular plants in the Philippine forests. His mind is like a fountain of knowledge, it seemed unending. In every stop, he would pick out a leaf or a fruit to explain what it is, why it is so and why it is important to the forest. Leonard is also very dedicated and patient with us, his 'students'. At the start of my thesis I could recall emailing a bunch of experts for plant identification. The others eventually got tired answering my inquiries but Leonard religiously answered with his insights on the plants in question. He perpetually rummaged through each posted specimen. He answered back even when he was away on an expedition. Some replies were delayed (if he was in excommunicado) but once he got into it, the plant identification would flood our emails and the Facebook pages. As an architect I needed 5 years of college and more than a decade of experience as education. As a landscape practitioner, I needed 5 years of graduate classes and still need an impending board licensure exam. But as a conservationist, I got the most valuable lessons and experiences from those small talks and emails from Leonard. He probably gave me the best lessons I could learn as student and researcher. Now the information will stop. But his teachings will have to echo in us and in every other conservationist. You will live on, great teacher! Our friend and great mentor in the Philippine Native Plant Conservation Society, Leonard Co, passed away in Leyte last Monday because of an alleged senseless killing. He was there to do additional research on Philippine plants. Upto the end he was searching for more knowledge about our Philippine forests. He is the greatest plant taxonomist I have met no doubt. He is also the most generous in terms of his expertise, readily giving away his knowledge on plants and taxonomy. His loss will be mourned by those whom he inspired and the interest on native flora he ignited. Sir Leonard, may the fire you kept lit continue to burn. You will be missed by us. We will make sure you will be remembered. Kampupot sa Ilalim ng Tulay! Q uickpost: I was in Maloma, San Felipe, Zambales. I chanced upon this nice massing of pandakaki (Tabernaemontana pandacaqui) or what they call kampupot. The plant is a very common fixture along the coastal areas in Luzon. But most I have seen are quite scraggly. This specimen caught my eye and looks like it was planted there, which I doubt as most plants there were common weeds and grasses. Just goes to show that some of our native flowers are indeed very landscape worthy. I have been very busy for the past weeks. Yesterday I got to surface from work to join some Arki friends in their trip to Bagac, Bataan - to see Las Casas Filipinas de Acuzar. This is a brainchild of the owners of San Jose Builders. It was an ambitious feat (fortunately the proponents of Las Casas had the resources and the drive to push through with it) of recreating the old deteriorating houses from the different tired districts around Luzon. Before these houses succumb to being forgotten, they are given new life in a historical site in Bataan, ironically near the kilometer zero marker of the famed Death March. A big discussion was raised o n whether this refuge for heritage houses would be the way to go in saving some of our historical structures. But finally seeing the Acuzar houses would let you understand the passion and mission the owner have in mind. Probably disqualifies the 'heritage resort' as a heritage site, but ...it still is worth to be called a practical museum to showcase these very important pieces. They are surviving proofs of the old Pinoy lifestyles and are worth to be salvaged - where they would be better preserved.